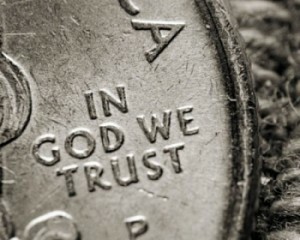 the WRITE Balance: In God We Trust - Do We Really? Day 3: Why aren't we more thankful? As a society we have more gadgets, more abundance, more opportunities - even in a recession - than just about any other period of time. And yet our favorite pastime is complaining and demanding what we 'deserve'. For my little family, understanding why we aren't thankful is key to growing gratitude because the why points directly to the problem. Last night I was in a funk and being very hard on Mr. Butler, demanding and griping. There was no gratitude or respect in my heart. Why? Really it was because I was tired and I wanted his attention. Without thankfulness, we often are filled with ourselves, our worries, our needs and not trusting anyone, least of all God to take care of anything. In this state, we lose sight of the really good things we could be doing in someone else's life. Remember that we have a God to fill all our earthly needs. Instead of holding tight to your little world, be thankful you have one and open it up to others. What are some of the reasons you aren't thankful sometimes?